The First Church of Christ Scientist in Wheeling was organized in 1906. 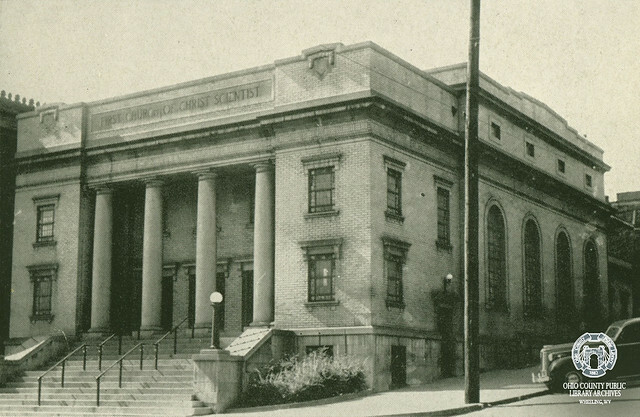 The congregation dedicated their church building, located at the northwest corner of 14th and Jacob streets, April 4, 1926. Designed by E. Edward Wolfe of Sandusky, Ohio, the building features a blond brick facade with Doric columns lining the entryway. Stone sills support opaque geometric windows. It is now part of the East Wheeling Historic District. The building was the home of Wheeling's First Church of Christ Scientist from 1926 until 1994. It has been the home of Agape Baptist Church since 1995. ▶ Vertical file: Wheeling Christian Science Churches. Wheeling Room, non-circulating, ask for access at the Reference Desk. ▶ Vertical file: Wheeling Baptist Churches. Wheeling Room, non-circulating, ask for access at the Reference Desk.